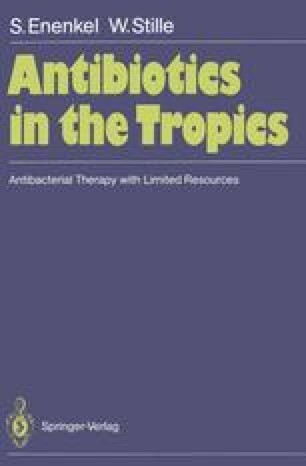 The problems of bacterial resistance currently encountered in developing countries are to a certain degree comparable with the conditions met in Europe and the USA in 1950–1970; however, there are also remarkable differences. In developing countries there is usually a nonavailability of bacteriological services. Resistance is most often registered as clinical failure. Where a bacteriological laboratory is available, more often than not only simple routine tests can be performed; even widespread problems of bacterial resistance may thereby either remain undetected or appear as local problems only. Generally, bacterial resistance is of more concern in developing countries than in developed countries. Infections with resistant Salmonella, Shigella or Neisseria gonorrhoeae, for instance, are far more frequent. Resistance to common, widely available antibiotics such as the oral agents on the WHO list cán not easily be overcome by the use of expensive parenteral antibiotics [6,10].